Are you looking for the perfect Beach Condominium? It isn’t always easy to find! You might find a great view, but the furniture is outdated. Or you find a great location, but have to sacrifice the view. Very rarely does a place come along that has the perfect mix of location, new designer furnishings, and a spectacular beachfront view, but Loggerhead Cay 513 is that place. Loggerheads 513 is a meticulously maintained, upscale beachfront condominium, located at the desirable east end of Sanibel, and is the most exclusive and best kept secret at Loggerhead Cay! 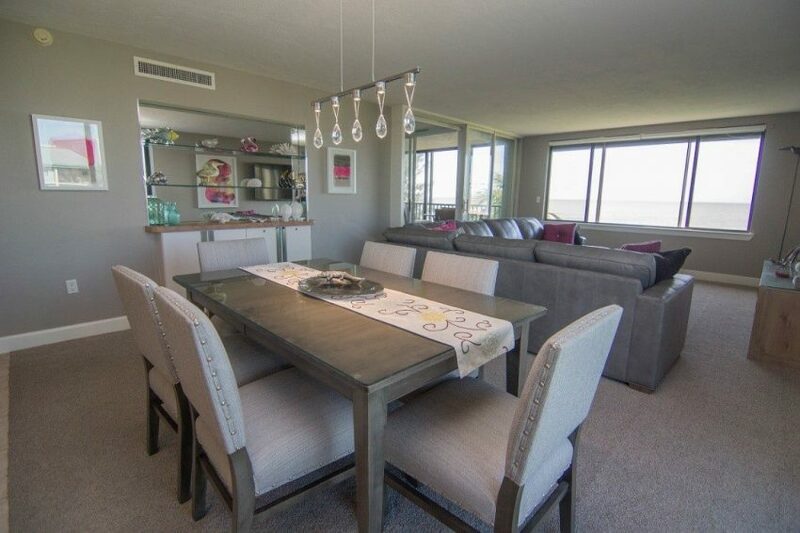 Sitting directly on the beach, and overlooking the white sands, shells, and miles of sparkling aquamarine gulf waters, this modern classic embodies a calm, cool aesthetic that sets 513 apart from every other condo at Loggerhead Cay. The elegant and understated classic architecture and décor blends seamlessly with the panoramic views of sand, water & sky, in a perfect coupling of the modern and natural worlds. Because 513 looks directly out at the warm, calm waters of the Western Gulf of Mexico, it is the ultimate place for guests to enjoy views of playful dolphins, turtles, sea, sand and sun. Loggerhead 513 was recently remodeled, and the furnishings are modern, elegant and tasteful, and you will want to come here again and again! This breathtaking waterfront 2 bedroom / 2bath condominium will be the perfect setting for your next beach vacation. The Loggerhead Cay grounds are conveniently nestled on Sanibel beach, near the historic and picturesque east end. This area is home to the Sanibel Lighthouse and Park as well as some of the best sunrises, sunsets, shelling, wading or swimming on the West Coast of Florida. The heart of the Island is only minutes away by car or bike, where guests can stroll and enjoy the myriad of Island shopping and dining experiences. Oversized picture windows in the living room give you amazing views of the waves, and the open floor plan feels spacious, clean and bright. The adjacent dining area has a modern table with custom-upholstered seating for six. The living area opens onto a second bonus lanai, for enjoying your morning Latte’, or watching the sunset after dinner with a glass of wine. Loggerhead 513 is an uncommonly beautiful space, fully appointed with everything you will need for the perfect beach vacation. The luxurious master suite features a King bed with upholstered headboard and platform, and the gray & white finishes create a cool sanctuary to relax after a day in the sun. The master bedroom’s floor-to-ceiling sliding glass doors lead to a screened lanai with a table, chairs, and upholstered lounge furniture, and this lanai can be open to the living spaces or closed off for the ultimate in private luxury. The modern kitchen has all stainless-steel appliances including a refrigerator and freezer, dishwasher, flat range stove, built in microwave, large stainless-steel sink, and a breakfast bar that seats four. The kitchen is stocked with modern countertop and hand appliances, dishes, glasses, utensils and cookware designed to accommodate every need, even at maximum occupancy. The bathrooms include custom-made designer vanity tops, all new fixtures, faucets, accessories and upscale glass and tile décor. Enjoy the oversized frameless glass showers, for a spa-like relaxing experience. However, please note, this is a very exclusive condominium, and it does require a 7-night minimum stay, and accepts SATURDAY TO SATURDAY BOOKINGS ONLY. If you would like more information on this unit, contact Select Vacation Properties – Vacation is our middle name!